Kobo unveiled an update to its Google Android App that allows Japanese customers to purchase ebooks directly from the store. This will allow anyone with an Android phone or tablet to read comics, manga, and ebooks in their native language. 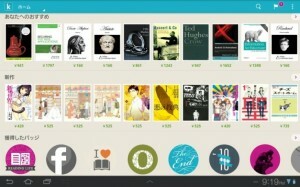 One of the big changes to this app was the integration of Rakuten user ID’s into the Kobo experience. This will eventually pave the way for Rakuten to tie its other online properties into Kobo and offer discounts and subsidies on the entire e-commerce network.